I've been in a quest for the best tasting Bak Kut Teh in the island for a long time now. Unfortunately, right at this point it still remains to be a mission. While I'm yet to accomplish that desire, I've already had a number of servings in some Kopitiams. The very first time I had it, I was instantly reminded of my grandmother's bulalo soup back home. Apparently, hers is not the typical version of Bulalo Filipinos are accustomed to. She usually adds chinese herbs into it. Hence, it was so familiar when I slurped my first try of Bak Kut Teh. The taste is just so similar. It's been a while since a post on home made goodies or a dish recipe has been uploaded here. It's not because I'm no longer cooking at home nor have given up my enthusiasm on it (for that's certainly next to impossibility), but rather current circumstances prevented me from doing so. Hence, I'm glad to be able to share another recipe of one of my favorites again. 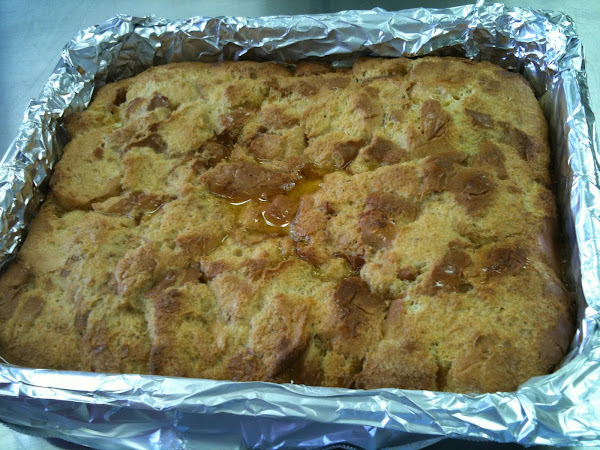 Actually, this Cinnamon Bread Pudding recipe is not new in this blog. I've already posted it 2 years ago. However, I haven't made it since then much less since we relocated to Singapore. Also, I made some modifications on the recipe for a bigger serving and I used a different kind of bread. Meet the "Lumpiang Sariwa" (Fresh Spring Roll) of Singapore, locally known as POPIAH. Sweet, generally tasty and can be made spicy. That's the overall melange of flavors that can be found in this filling yet enjoyable snack item. I usually grabbed a piece of my favorite at Takashimaya's food court. It's a simple food to prepare but its key of acceptability lies heavily on the wrapper and the sauce used. The filling can be as varied as you can imagine. The usual ones are turnips, carrots, garlic, bean sprouts, egg, dried shrimps, fried tofu, chinese sausage, ground peanuts, fried pork and lettuce leaves. Normally, the preferred types of sauces/pastes are first spread onto the wrapper then filled with the necessary fillings. Afterwhich, it's rolled and cut into bite size pieces. I wonder if there are other variations though that can make this spring roll even more enticing. Perhaps, that's something to look forward to in any next taste trek around. It's good to be back home in SG after the recent festivity. We spent the Chinese New Year vacation in Kuala Lumpur, Malaysia. It was a nice experience to say the least exploring the capital city of the country that's well known for that genuine Asian claim - "Truly Asia". 4 days were actually not enough to explore this throbbing yet still a bit calm, distinctively historical yet fast growing metropolitan. Sweet, tangy, juicy and a tad sour. These are the flavor elements you can find in the most popular salad around town - Rojak. The name implies "mixture" in malay. It's a blend of fruits and vegetables generously coated with a sweet dressing and drizzled with lots of chopped peanuts. I've been meaning to try this traditional salad for a long time now and finally I had the opportunity to sample a plate at the newly opened Nex shopping centre in Serangoon. Texture wise, it's quite playful in the palate granted that the crunch of the fruits and vegetables are preserved. On the overall taste though, it's way too sweet for me. It's beyond my capacity to consume a plate.